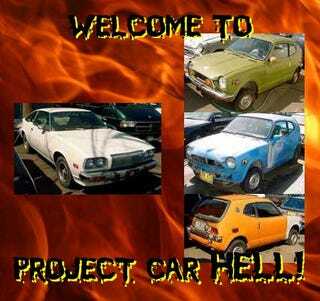 Project Car Hell: Mazda Cosmo or Three Honda 600s? It really wasn't fair putting a British car up against a GM A-body in yesterday's Project Car Hell matchup, because the ready availability of A-body parts gives you too many escape hatches from Hell. In any case, the Esprit blasted the Olds by winning with a Nixon-versus-McGovern-esque landslide. Today we're going to drop the price tag a bit, go with two Greater East Asian Co-Prosperity Sphere choices, and return to the Multi-Car Madness schtick, but with a twist: one car versus three! Now, even if you've got more hits than Sadaharu Oh, you'll still want to roll with a car that packs 868 home runs worth of Japanese cool. Yes, we're talking about the Mazda Cosmo, this '76 Cosmo to be exact. Just imagine: for only $2450 you could get fully Cosmo'd up, at which point you'd be the envy of your local Wankel scene with one of the rarest of sold-in-America Mazdas. The Cosmo (also known as the RX-5) didn't sell well in the US market, and those that did make it here have mostly succumbed to apex seal woes and/or rust by now. Did we mention that it doesn't run? Do we even need to mention that? Yes, you'll probably have to replace the engine and who-knows-what-else (get ready for some overseas shipping charges for most non-mechanical parts), but just imagine all the room under the hood for turbo plumbing on the insane rotary this car deserves! It's hard to pry one's eyes away from that Cosmo, but it's equally hard to deny the goofy appeal of one of our all-time favorite Hondas: the motorcycle-engine-powered 600. And, since having a private junkyard is always a plus when you have a hard-to-find project car, these three '72 Honda 600s should have enough parts between them to make one- or even two- runners! I (briefly) had a 600 many years ago and the Fun Per Dollar Quotient is off the scale; they're quicker than you'd expect and actually fit four large adults in semi-comfort. This seller is quite honest, stating up front that all three cars will need complete restoration, but you'll be able to pluck parts off two of them to feed the third! $1500 and they're yours.